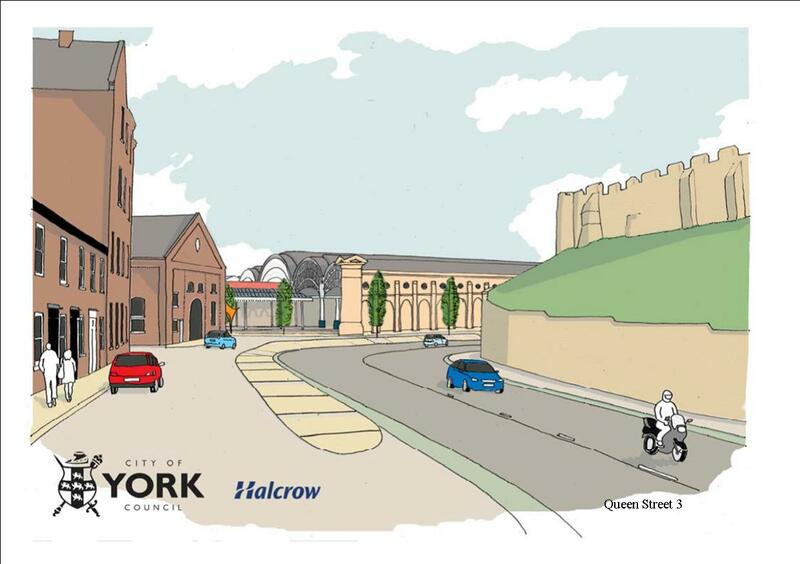 A Council working group is discussing today what the new road layouts may be as a result of the redevelopment of the land behind the station (York central) and the former British Sugar site on Boroughbridge Road. Most interest is likely to be generated by the illustrations indicating how the area around the station might look if the Queen Street bridge is demolished (see right). 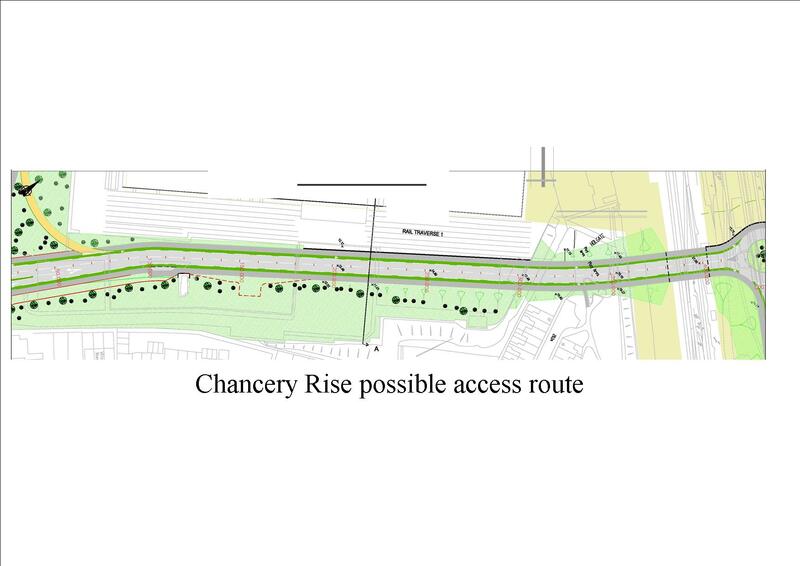 However, the report also names Chancery Rise (the former access to the carriage works) as the potential major access to York Central. 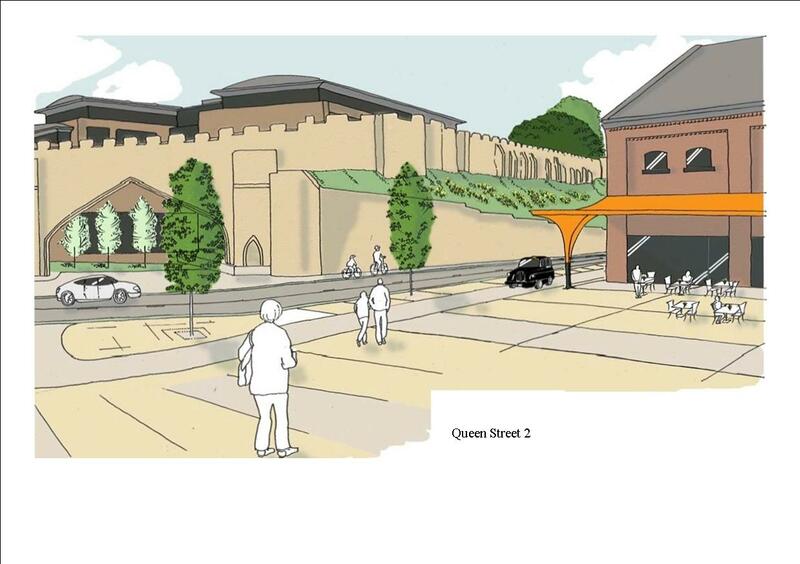 The route would run parallel to Wilton Rise and could affect the Cleveland Street playground. This route would be the cheapest to build at an estimated cost of £9.1 million. Other alternatives near the Holgate Business Park are still being evaluated. These options would also have some amenity impact on adjacent residential properties on Renshaw Gardens, and require re-provision of existing open space. It is likely that a second access would be provided from Water End near the Millennium Green. This is likely to be towards the end of the development period. 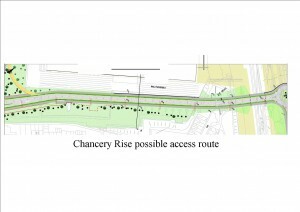 Some other local access routes into the site from Leeman Road are also now planned. The Council report is weak on indicative costs. There is no split between the assumptions being made on developer (S106) contributions and public sector liabilities. There is also a need for clarity on proposed access arrangements through the Marble Arch Bridge. There are massive implications on the rest of the City’s road network and these need to be modelled as soon as possible. Residents will expect (and need) informed consultation with choices. 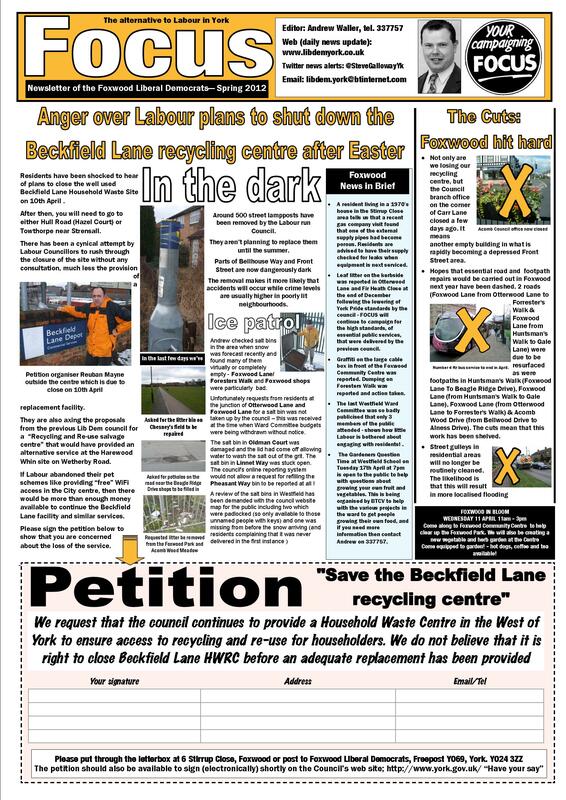 There is a major possibility of confrontation with some Leeman Road/Holgate Road residents if they are not given more information quickly and in an accessible format (the Council report contained 450 pages with other supporting papers only being available on the web). 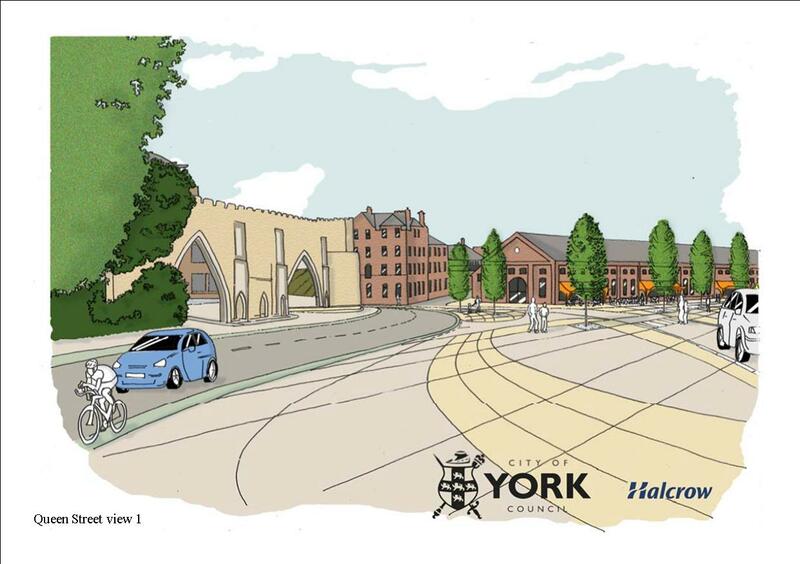 There is also a need to address issues like the provision of off site parking (for York Central residents) at – for example – the park and ride site. This development is currently effectively on the shelf because of its costs. It will go ahead at some stage – the only issue is “when”. The time available needs to be spent separating the “nice to have” (demolishing Queens Street Bridge?) from the “essential” (the bridge access from Boroughbridge Road), if an early start is to be brokered. Heavy rain restricted the numbers of signatures that volunteers were able to collect outside the centre today. They hope to be back next Sunday. 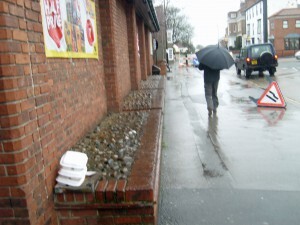 Hard on the heels of disappearing lampposts, not to mention the Council branch office on Carr Lane, residents have reported the loss of several litter bins from the Front Street shopping area. 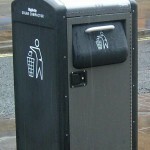 They have been replaced by one of the new hi tech bins which reports itself when full. 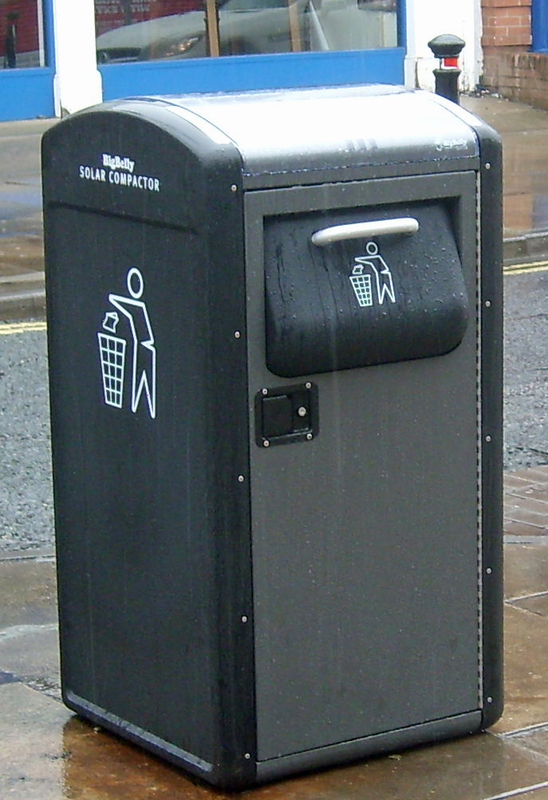 Earlier reports had suggested that this type of bin would be trialled in the City centre. 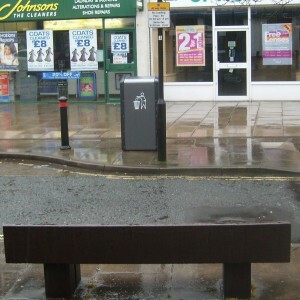 It seems now that Acomb residents will be the guinea pigs for these bin trials as well. 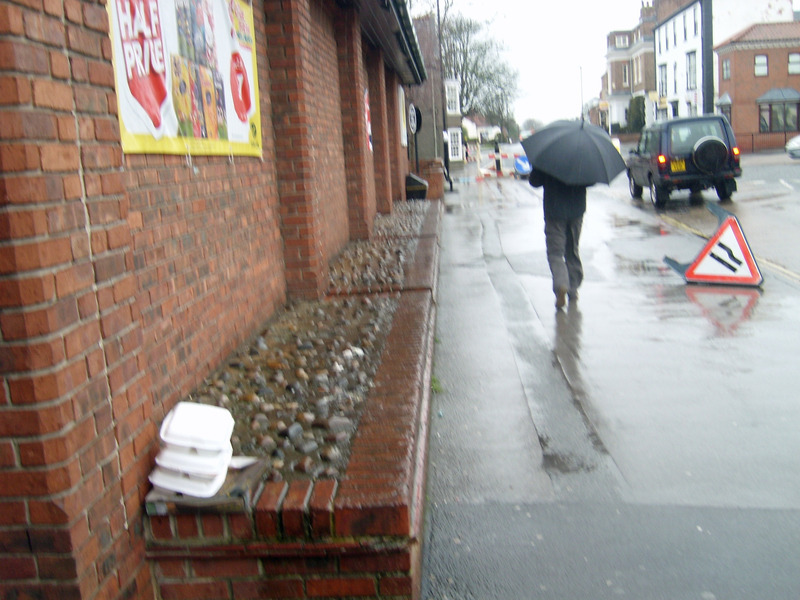 Litter neatly stacked on Front Street 10 metres from a bin! 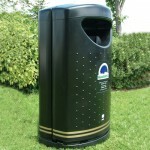 City of York Council and Yorwaste have teamed up to give local residents free compost this spring and summer. The compost will be available from 9.30am until 2.30pm each day and residents are asked to bring a shovel and bags or containers to take the compost home in. 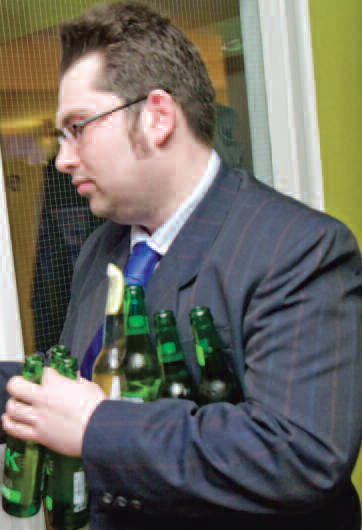 City of York Council has called on the government to provide local authorities with powers to manage discounted alcohol promotions. 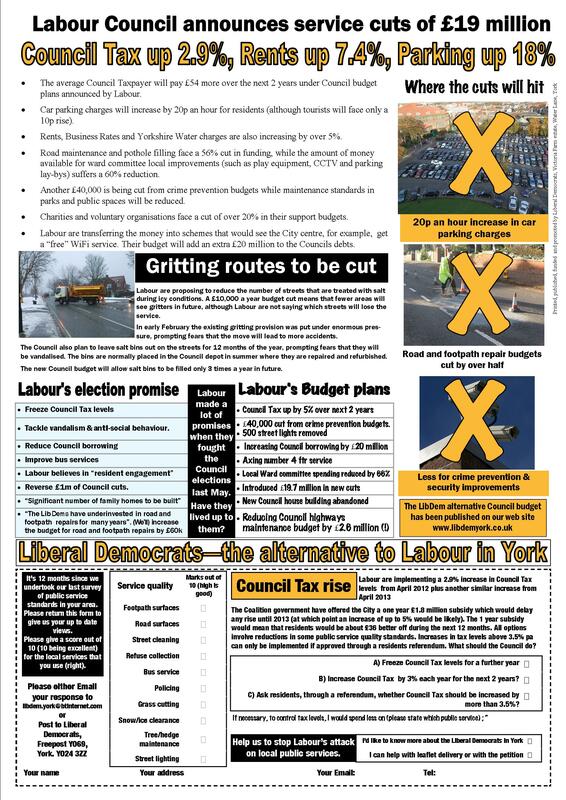 Councillor James Alexander, Labour Leader of City of York Council, has written to the Minister of State for crime prevention and antisocial behaviour reduction, Lord Henley, asking him to look at strengthening local authorities’ regulatory powers. In his letter, Councillor Alexander said: “I have become increasingly aware that there are significant problems in the city’s local night time economy resulting from ‘price wars’ between licensed premises (bars and clubs) offering reduced entrance charges and discounted alcohol prices….the damaging effects of this type of promotion on crime and disorder, public safety, and individual health, and the viability of local businesses is undermined by this irresponsible approach to pricing. 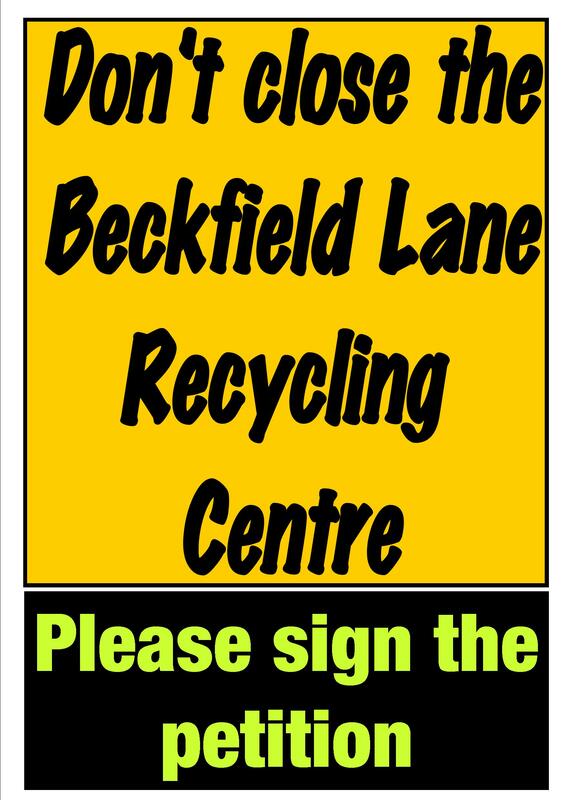 About half a dozen residents were outside the Beckfield Lane recycling centre today collecting signatures on the “Save Beckfield Lane Recycling Centre” petition. Around 100 signatures were collected in the first hour with many users taking forms away to collect more support. 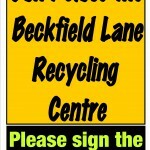 Volunteers are required to help collect signatures at the centre on Sunday. 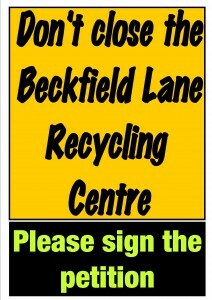 Ring Andrew on 337757 or Reuban on 781589 if you can help or if you would like a poster or car sticker to display. 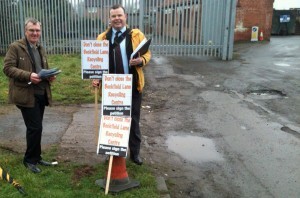 Residents have started an “on line” petition aimed at persuading the Council not to close the Burnholme College. “Burnholme is a small, caring, supportive school in the heart of the community. It has great GCSE results and a Good OFSTED report. The best Value Add(Student improvement) in the city. The school is willing for anyone to visit to see for themselves”. This ePetition runs from 02/03/2012 to 12/04/2012. England, Ireland, Scotland and Wales will be represented by teams composed of stars from sport and TV undertaking a 1,000 mile challenge – each team running the final mile through the city of York finishing at the Eye of York for an overnight stay. As part of Sports Relief 2012, four national teams will start the race simultaneously from their home cities of Cardiff, Dublin, Edinburgh and London and will head off clockwise around the UK and Ireland via the other four capital cities as they battle to be the First Nation Home. Participants include top TV presenters and celebrities Gethin Jones, celebrity gardener Diarmuid Gavin, presenters Andrea MacLean, Phil Spencer and Craig Doyle, actress and model Gemma Atkinson, Olympians Sonia O’Sullivan, Iwan Thomas and Chris Boardman, Dame Ellen MacArthur and rugby stars Thom Evans, Josh Lewsey and star of Big Brother, Gareth Thomas. Scotland arrive on 10th, Ireland 13th, Wales 15th and England 16th March. Join the Civic Party and give them a good Yorkshire welcome! A leading children’s charity has hailed City of York Council’s library services for being a ‘good place for all young people to come’. 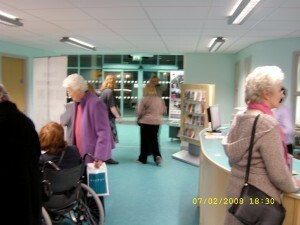 The Children’s Society has praised the council after an assessment was carried out by disabled young people who visited Acomb Explore Library Learning Centre last November. In feedback provided to Acomb Explore, the young people unanimously agreed in their report that the Explore Centre “provides a wide range of inclusive activities, it is fully accessible and the staff have a good attitude”. The ‘Good Place To Come’ Award is granted by disabled young people from The Children’s Society’s PACT project in York who aim to help places become more inclusive to disabled people.